Tiffany Knopik was born and raised in Dickinson, ND. She moved to Bismarck in 2007. 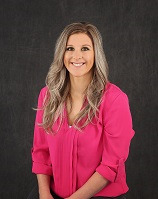 Tiffany attended Rasmussen College, graduating with an Associate Degree in Massage Therapy in 2009 and an Associate Degree in Paralegal Studies in 2015. Tiffany has worked with Scott Porsborg and Mitchell Armstrong since 2012. Tiffany currently resides in Bismarck with her husband James, son Jayven, and step-son Elijah.